I am consistently amazed at the existence of certain technology. Like Pandora: it is free radio, all the time, and all I have to do is turn down the volume every so often to avoid listening to an advertisement. Then, I get more good music coming through my computer or my phone that is magically personalized to my taste, and all for free. We live in an amazing time. This song from Cage the Elephant came on my Pandora station the other day: "There Ain't No Rest for the Wicked." And while I like the song, I hadn't really listened to the lyrics before. It tells a story of a narrator interacting with various wicked people (a prostitute, an armed robber, a crooked pastor): each of them living wicked lives, hurting themselves and others, because, like the song says, money don't grow on trees. They got bills to pay, they got mouths to feed...ain't nothing in this world for free. They always need money, and that is never going to change, so the prostitute, the robber, and the crooked pastor do what they have to do. It got me thinking that this is basically how life was when I lived paycheck to paycheck. There was no rest, and there never would be, because the bills would never stop coming. Like Dave Ramsey says: all the money came in, and then all the money went out. Lather, rinse, repeat. I lived like this for the majority of my working life. I had been working 40 hour weeks in white collar jobs since I was nineteen, through my undergraduate degree and my teaching credential, and still on through to today. Some jobs paid a lot, some didn't - but that didn't really matter, the way I was spending. Whatever I took home was quickly spent, and then some. Debts accumulated, but that was no big deal: those credit cards were just different bills to pay. Because my natural state was to send off all my money, did it really matter who I was sending it to? Since we know that acquiring material goods doesn't provide lasting happiness, I think on some level I was fine with giving a credit card company a portion of my check every month. Who cared that I was sending $100 to Chase instead of spending that $100 on, I don't know, some booze or new clothes? Neither option made much of a difference in my overall satisfaction with life, so why not have a portion of my pay go towards creditors? At least that kept me from buying one more piece of junk to throw into my closet and, eventually, the trash. If my steady state was to simply give away all my money, it didn't matter who got it. And thus I had no motivation to get out of debt. It didn't help that, literally, everyone I knew was doing the same thing. We all grinded along, working just to pay our bills, and hopefully get back to zero at the end of the month. No rest for the wicked. At that point, I had no savings, other than the mandatory retirement account that my employer made me contribute to, as they had a defined contribution plan. Thank goodness they at least made me contribute a few percent of my income. Instead of savings, I had thousands in credit card and student loan debt that would take years to work through. But had my wife not pointed out an alternative to spending everything I earned (she called it "saving") I would have been on that treadmill for many more years. Decades, probably. Instead, she got our finances on track. We slowly started using my paycheck to pay off my debts, and then to save for retirement, and a down-payment on our first home, and the rest is history. I don't mean to say that people living paycheck to paycheck are "wicked", of course. If anything, I mean the opposite. Still, I think Cage the Elephant should have used the other popular version of the idiom: there ain't no rest for the weary. Because that is state of people working their whole lives just to pay the bills and to feed their loved ones. They are tired and weary and, sadly, there is never going to be rest, until they find a way to make a change. And that change isn't some big raise, or an unexpected windfall, because those things never did me any good when I was living paycheck to paycheck. The change is keeping a little of your paycheck for you, the future you, and not sending every dollar off to stores and bills. But what am I telling you for? You guys know this already. Do me a solid and forward this to some weary friend of yours. 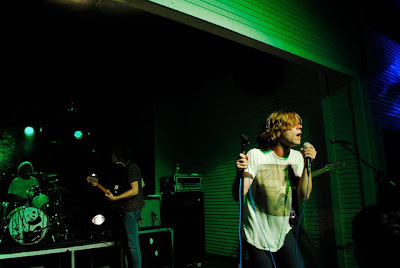 *Photo of Cage the Elephant is from Candace Longoria at Flickr Creative Commons. "weary" is so dead on! It's a word I don't use often enough, but it takes all the parts into account... defeated, stressed, restless. I also love that you managed to write a post about this song - I was singing along (in my head, thankfully) as soon as I read the title! Ha! I'm glad you were singing along, even if only in your head. I dig the song. I love that song for the beat and never really paid attention to the lyrics - great breakdown, Mr. DbF. And wow - Mrs. DbF sounds like a catch indeed!! Early on, B would constantly ask about specials or when reverse happy hour (like ones that started at midnight) would be on our first few dates - I admit, it was quite the turn-on since I could tell from these subtle nuances that he was good with his money! See, being frugal is a good thing! Why don't they ever tell guys this stuff growing up? My whole life, I thought you had to be a big spender to get the ladies. And yeah, Mrs. DB40 is a total catch! Luckily I never fell into the debt cycle. My steady state has always been very simple so I saved money without even trying. I know that's not how everyone operates and I'm very lucky in that regard. I imagine it's got to be a nightmare to be living through that. It sounds like non-stop work followed by your mind never stopping because of thinking about money. The closest I came to being in this situation was when I was laid off and money started to get tight, it was then when my financial life really turned because I realized how much better it is to be financially secure rather than have the latest phone or newest fashion. I love hearing how others have avoided the consumer lifestyle, and are just natural savers. My wife is that way. I wonder what the differentiation is. Did your parents instill good saving habits in your youth? Are you just not that infatuated with the trappings of consumer culture? I love how your wife called you out! I'm not impressed by guys spending money on me either. I guess I'm also lucky in that I've never lived paycheck to paycheck. I watched my parents do it and everyone was so anxious all the time. Sadly my boyfriend's mom thinks it's perfectly normal, and I guess a lot of people agree. That's great that you didn't fall into the same trap, EM, either in spending money yourself or in wanting others to spend on you. Living paycheck to paycheck is no bueno. I have no way of confirming this, but given our paltry savings rates nationally, my guess is that it's nearly universal. Wow, your future wife was BOLD! That is amazing! Yeah, she's kind of the best. That marked the turning point in our financial lives, without a doubt. Great song, EcoCatLady, though really sad. I want to give Paul Simon a hug. It truly is impressive how far you've come since 2007. Inspiring really. I'm definitely going to send this to my brother. Mrs. DBF sounds like a really special lady. Stick with that one, and you'll be just fine. Cheers. Thanks, friend! And I really appreciate you sharing the post. Agreed on the missus: I have no plans on letting this one get away, that's for sure. You nailed it, Tonya. I was totally running on that hamster wheel. I had nowhere I wanted to get to, so why not run in place? Her only brother is unfortunately married. But your as frugal as Mrs. Done by Forty, and a real catch. (I mean, a fit girl who plays volleyball, drinks beer, and plays the ukulele? That's a triple threat.) Some lucky guy in SoCal is going to be very happy he met you. Aw, thanks! I hear you on the debt repayment, GMD. It's a grind. But your bottom line doesn't know the difference between $10k applied to debt and $10k invested, if both have the same rate of return. Both help future you exactly the same way, and you're making incredible strides towards knocking out that debt. He had footed pretty much every bill in all his prior relationships... maybe that's why this one stuck? That's awesome. I'm sure he realized pretty quick after that, that you were a keeper, Mrs. Pop. Nice work, Amanda! Men need their wives' counsel. I like to think that in our relationship, I'm the sail and my wife is the rudder. When you have no money and negative net worth you're always tired and weary. It's like working at Walmart forever. Good call, Charles. Your story about working in Walmart illustrates the point well. That song comes up on my Pandora too! Definitely catchy. I really like the analogy you make here and like some other commenters, I didn't know this part of your personal story. You definitely found yourself a keeper! Thanks, Matt. I was fortunate, in a lot of ways, to meet my wife. It's nice to be able to share our story here, too. Yeah, I'd have to say that I did the same thing with my wife. We went out to eat allllll the time. We look back on that and think what a waste. You do crazy things when you're in love. That's true, Michael. Love does make us do crazy things. Back in the early stages, my love for her was so motivating that making big changes was easy. Had she wanted us to go both vegetarian, or start watching soccer, who knows...my life could have been very different. Thank goodness you found Mrs. DB40...where would you be without her! haha. Well I'm glad she opened your eyes and you found this path the two of you are on now. It's great that you were receptive to it because I think some guys would be defensive and think that there's nothing wrong with the lifestyle they were leading. Ha! I'd probably be broke in San Diego without her. No bueno. I hear you on the defensive thing. I think on some level, I was ready for a change financially. So I was more receptive to it than I might have been, say, early on in my working career. Glad your wife set you straight. It took her to point out that pretending to be a person of means while running up debt was not smart nor attractive. You are indeed a lucky man. You got that right, Bryce. Totally agree with you there... My first few years of working were kind of like that too. I spent a lot more than I needed to be spending, especially given my salary at the time. And I still have co-workers who are like this who are the same age as me... It's almost like they do think they will never get tired or burned out from this game. Money In = Money out = Not sustainable long term! Well put. I wish I'd hit on the idea of sustainability in the post. I honestly believe most people are still living this way in America. It's hard to know for sure without digging into their budgets. But when I see so many new cars out there, with the drivers toting new threads and gadgets, I have a pretty good idea. I love that song! I would also try at Songza for your listening pleasures. I think it's so hard to live paycheck to paycheck and we live in an economic system that isn't perfect, so it's hard for some people to get above water. I feel overwhelmed by my debt at times, but I keep going! I've never heard of Songza but I'll give it a look. Thanks for the recommendation. I know that the path out of debt can be a grind in its own right, but it's all for a purpose. The grind to make it to payday is just surviving. I'm always so glad when I can be that realization in someones life to stop spending and start saving, investing, etc. That's how and why I got into blogging. That's a great reason to blog, Stefanie. I hadn't really thought of it in those terms, but that's probably a big reason I write, too. I love learning of the turning point for others. Your wife gave you a gift that will pay off for both of you for the rest of your lives, while also leaving a lasting legacy through your blog and future heirs. Thanks for sharing! Oh, I love the change of lyric here. It can be so true. And honestly, when you're so weary and desperate it can be a lot more tempting, or even in some senses morally justifiable to become wicked. Like the infamous stealing bread to feed your children dilemma. And your wife is 100% awesome. Thanks, Femme Frugality. I thought about touching on that point, about it perhaps being justifiable to do dumb and/or wicked things when you get that desperate. If we believe the premise, it changes our tactics when dealing with debt or any other financial hardship: we first should seek how to get the person some rest, and then progress might be possible. Great tie in DB, love how you made Cage the Elephant come full circle! Man to have a wife who said that none of the spending during your courtship meant anything to her, that is gold, you better keep that one! Congrats, and great post! You're absolutely right, Jim. A wife like that is worth a lot more than gold. Thanks for the kind words. I'm going to make Mrs. Done by Forty read all these kind comments, so she knows how lucky I am to have her. Thanks, FIREStarter! I'll definitely enjoy this week, without a doubt. You're definitely spot on with pointing out that material things don't bring happiness. A guy at my job today noticed my lunch (in a plastic target) bag and make a comment basically calling me cheap. It amazes me how people are so quick to judge others on the material things they own. You can laugh your way to the bank, while your friend is wasting his hard-earned money on crappy lunch takeout. You're right though: in a consumer culture, we are judged by our consumer purchases. It's the way broke people differentiate themselves: by the fancy stuff they own. First of all, I love this song! So catchy. Great article! You're right - there is NO rest for the weary. Living paycheck to paycheck is a tiresome routine, and unfortunately, one that many of my friends are still practicing. I hear you, Lisa. It's a grind, but it's so popular that many of us don't know of an alternative.